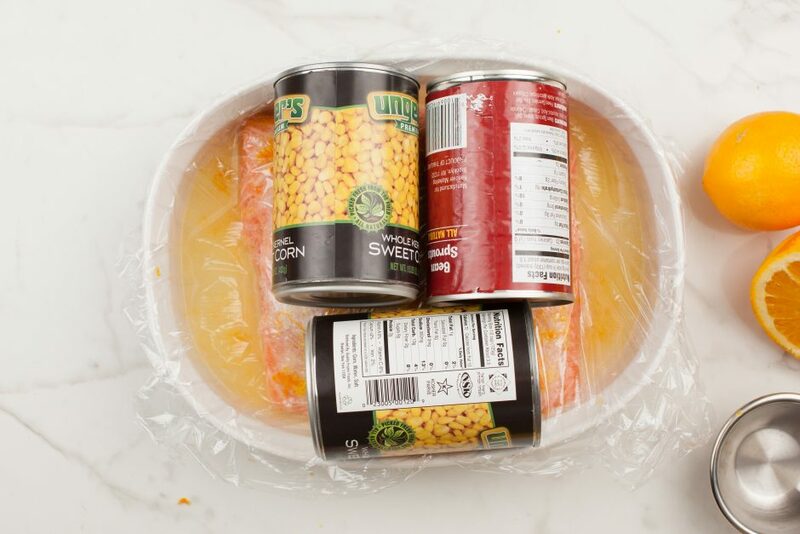 With Pesach just around the corner, many students and friends ask me for advice on how to organize and streamline holiday cooking and kitchen preparations at this time of year. Finding versatile recipes which yield a large quantity and can be made in advance easily becomes number one in the pecking order for holiday cooking. Throw in the economics of large food bills and it is understandable why many a home cook can get stressed! The ancient, simple process of brining has become a secret weapon of mine in the days leading up the Pesach. Also called “curing,” — that transformative art of preserving food with salt – is what changes the cellular structure of foods to give us many beloved delicacies and to preserve them for an extended period of time by inhibiting the development of bacteria. Think about the unmistakable flavor that curing produces, whether in your first bite of a corned beef sandwich or of its briny sidekick, the pickle. I’m a believer that anything homemade tastes better (you’ve probably guessed that I am by this point), but especially when a minimal effort will yield extraordinary results for a fraction of the price. A classic example and an easy place to start is salmon. 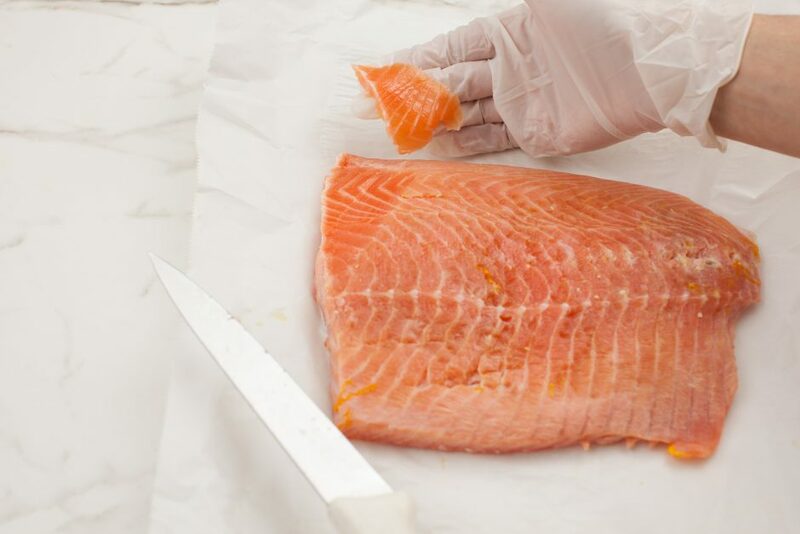 Cured salmon is very similar to lox in texture and flavor, except that it is not smoked. 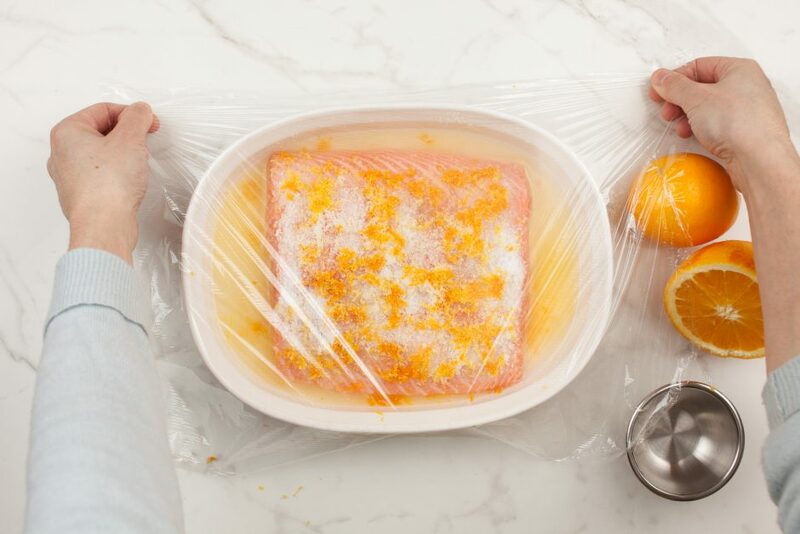 Home-curing salmon is a very simple thing to do and has the added bonus of introducing your own pick of flavors in the process. Traditional gravlax is famous for its dill flavor, but there are many other choices as well: citrus, anise, horseradish, etc. Once cured, you have a delicacy on hand that can be a bold embellishment, gussying up your plainest appetizer, or a subtle accent, incorporated into main dishes and salads for more complex dimensions of flavor… or at the very least, the fanciest cured salmon matzoh sandwiches at the park for half the price! I will typically cure a whole side of salmon in the days leading up to Pesach and then I’m set for the whole holiday. Fresh is best. 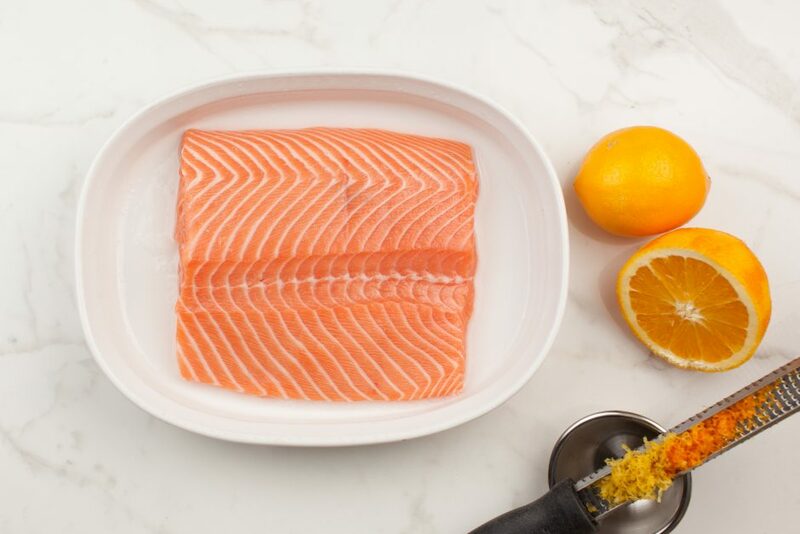 Look for salmon with a bright color, moist and firm in texture, with a clean smell – no fishy odor (if possible, wild salmon is the best!). Pan size matters. The fish will release a large amount of liquid, which when mixed with the salt will form the brine that cures the salmon. That’s a good thing! 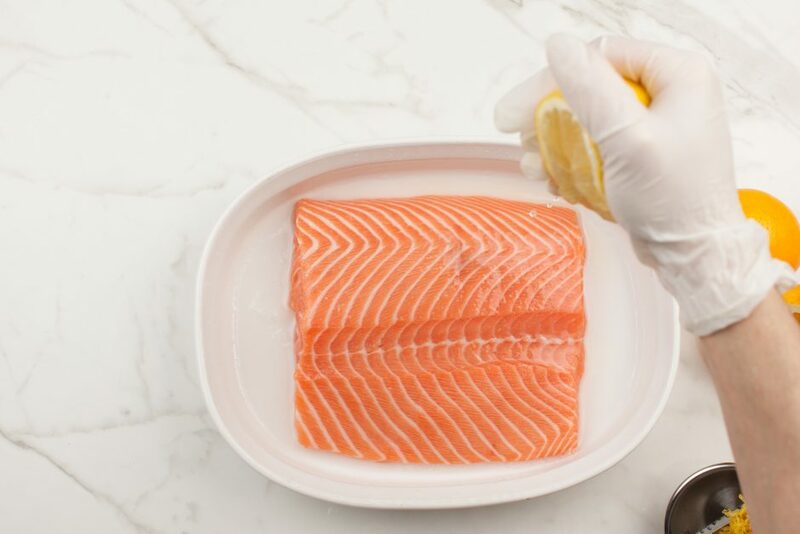 You want the brine to cover as much of the fish as possible, so choose a pan just large enough to hold the salmon with some extra space for the brine. Under a brick. Placing weight on the salmon will press out water and speed up water loss (ideally 4-8 lbs. of even weight to 2-3 lbs. salmon). Try to weight and press the salmon as evenly as possible. A heavy pan, brick or some unopened cans of tomato sauce work just fine. This is what’s known as a “moist” cure as it uses a high ratio of sugar to salt, producing a fresh and bright taste that will enhance a wide array of dishes and hors d’oeuvres. Slice paper thin for the best taste and flavor, and enjoy for up to 3 weeks if wrapped well in dry parchment paper in the refrigerator. 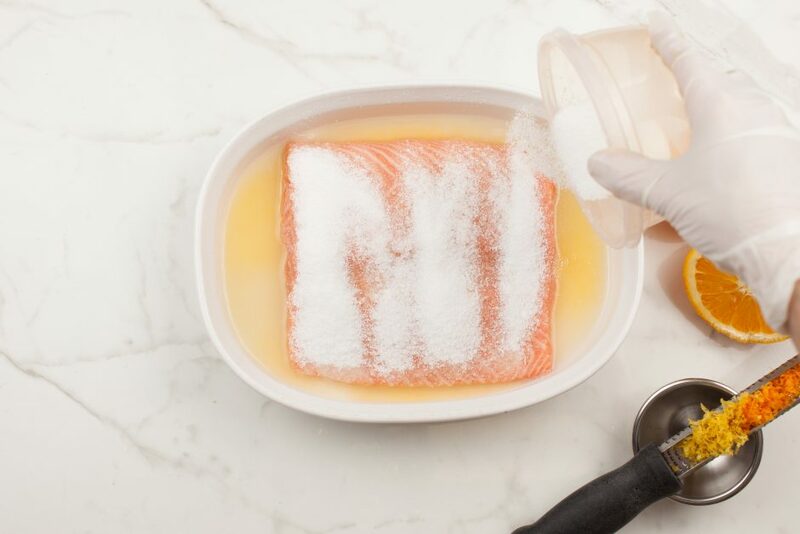 Rinse salmon fillet and pat dry with paper toweling. Mix the salt and sugar together. Sprinkle half of the mixture over the bottom of a pan or baking dish just large enough to hold the salmon. Place the salmon on the salt mixture. 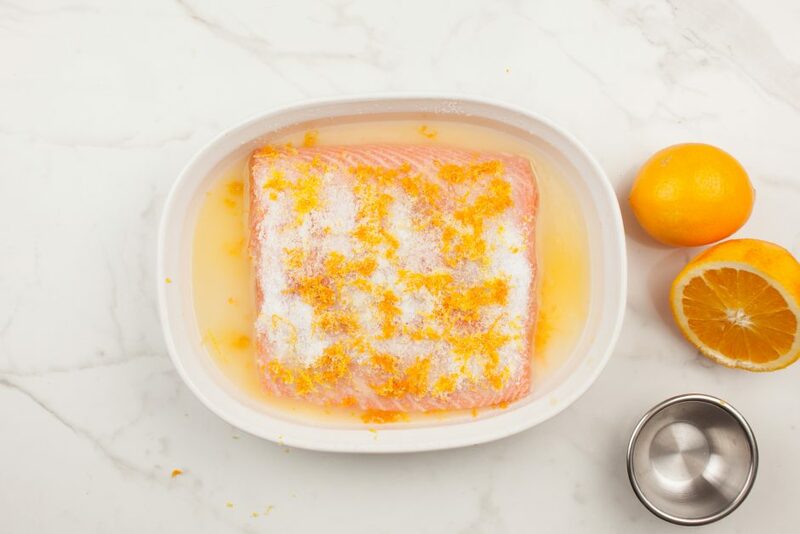 Drizzle lemon and orange juices and vodka all over both sides of salmon. Cover with the remaining half of salt mixture, then layer the lemon and orange zests, and a layer of fennel seeds. Cover with plastic wrap. Place a heavy pan, some cans or a brick on top of the salmon to weight it down. Place pan in the refrigerator for 48 hours. Redistribute curing ingredients over the salmon halfway through curing, as necessary. 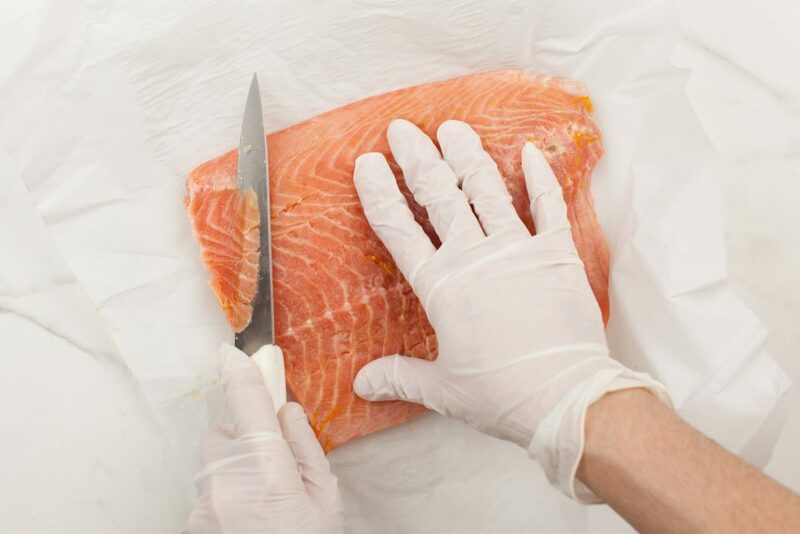 Salmon is fully cured when firm to the touch at the thickest part and has changed in color. If it still feels soft and raw, then cover and allow to cure for an additional 24 hours. 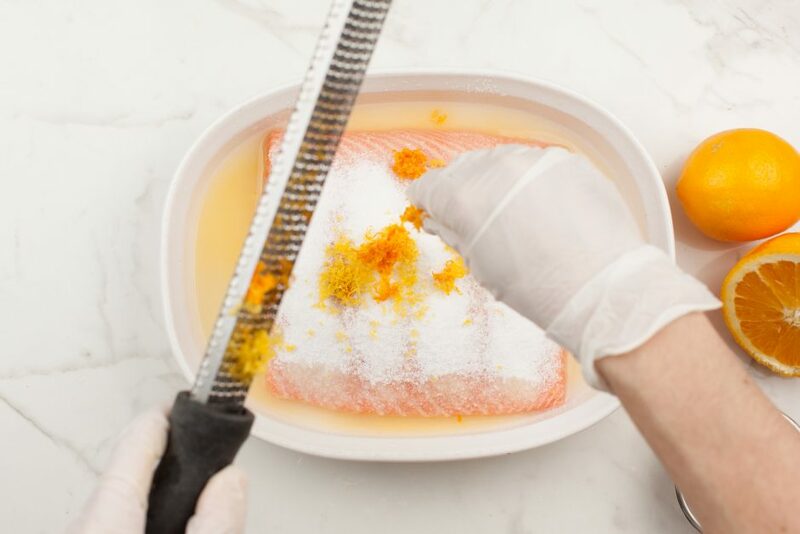 When salmon is fully cured, remove from brine, discarding liquid and spices. Rinse under cool water and pat dry with paper toweling. Wrap in parchment (or butcher’s) paper and refrigerate (rewrap if paper becomes wet over storing time). *Seeds can be toasted for 5 minutes in 300 degree oven or a small, dry frying pan on medium heat. Cured salmon can be served simply, sliced thin on toast, crackers or matzoh with crème fraiche or sour cream. If you want to further explore the possibilities, try this recipe for Citrus-Cured Salmon Avocado Tartare – delicious and elegant!